Ideal for bruschetta, slightly toasted in the oven, with a cheese based spread. Also great with a spicy cooked meal or a peace of roast served with gravy. 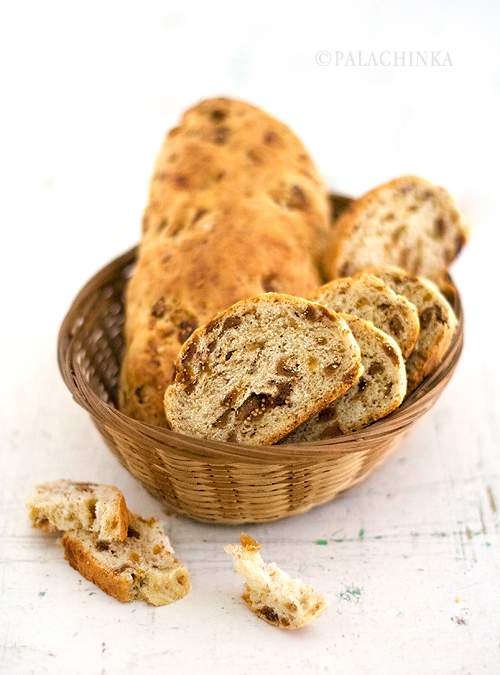 To some, bread with dried fruit and almonds isn’t a new thing, but to others, it will be a revelation. You need to try this! To have a fried dough for breakfast… After a teaspoon of slatko and a cup of coffee. In Sumrakovac village. Love it! The dough is called mekice, or mekike more often, and slatko is a type of fruit preserve that in Serbia we usually offer to the house guests as soon as they enter the door. It is served in a decorative bowl, alongside glasses, all filled with water. The guest eats a teaspoon of slatko, puts teaspoon in an empty glass and drinks from another. It’s an old custom and some people like to have it at their home first thing in the morning, before the coffee. So, back to mekice, the fried dough. It is basically a basic bread dough that Gaga‘s mom always has on hands. Flour + water + salt + yeast, and that’s it. Here, they eat them with fresh cheese, or sprinkled with sugar.